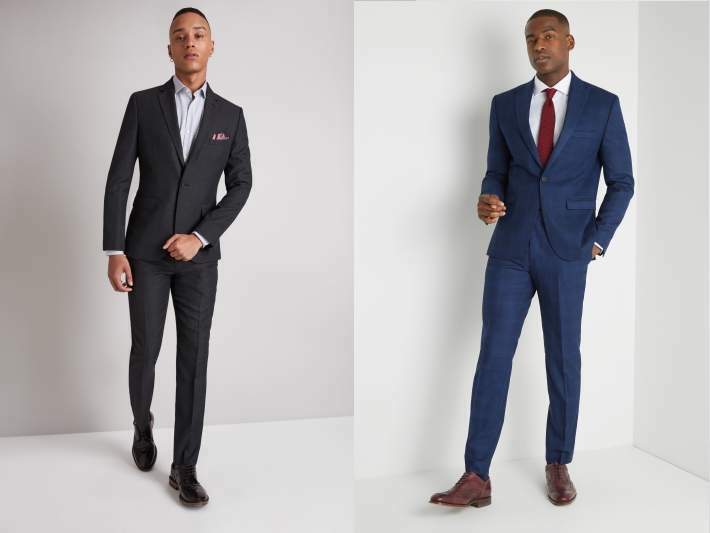 Some suits have been reduced £159.99, or even £249, so those are great savings, especially if you are needing something formal, wedding or just office wear? Stock / sizes are good on the range too. Here are just some of the suits included in the offer. You also have the option to purchase a matching waistcoat with some of the suits. Its amazing how a suit can change a mans appearance, he looks like a different bloke once he puts the grey suit on ! May I ask what is difference between Tailored and Slim fit? I wear tailored. Slim fit are too tight across the shoulders, arms and thighs. They're for skinny lads. Regular looks too loose for me. Everyone is different size and shape so best off trying some on first. 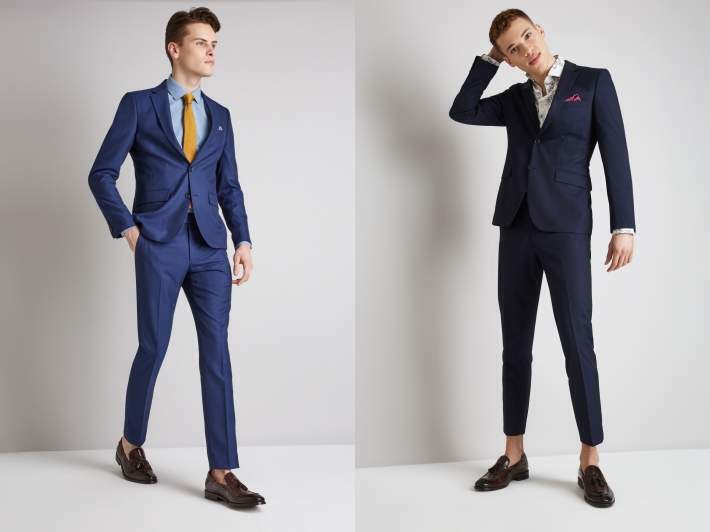 Skinny fit suits are for chavs and spice boys who fancy looking smart for that day at the races. The blood and vomit will wash off fine as these are polyester. Guess it's only Poly Viscose bags at this pricing ? Is 100% cotton or wool best material for suits. Need one dnt mind price but want something half decent. Is 100% cotton or wool best material for suits. Need one dnt mind price …Is 100% cotton or wool best material for suits. Need one dnt mind price but want something half decent. Generally the higher the wool % is, the better quality/longer lasting the suit will be. Depends on how often you wear it and how long you intend to keep it for. Polyester viscose are ok but if you wear it everyday don't expect it to last more than 6 months. 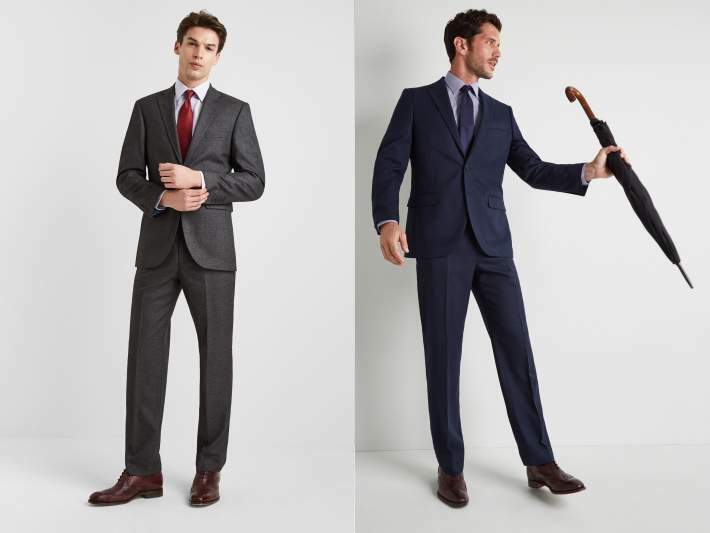 If you can spend more , absolutely get your suit with 70% or more wool. Take a look on Moss Bros or Slaters at this time of year as there was some good Hugo Boss and Ted baker ones ones for sale on here recently. As others have said the higher wool suits last longer, but also are better with hot/cold temperatures. Poly Visc suits just make you sweat all the time in hot or cold and after a while they develop a 'shine' which makes them look cheap. You will be better off with the higher/better quality wool content. They will feel much better and will regulate the temperature much better. Which means you will enjoy wearing them more. What about cotton vs wool? 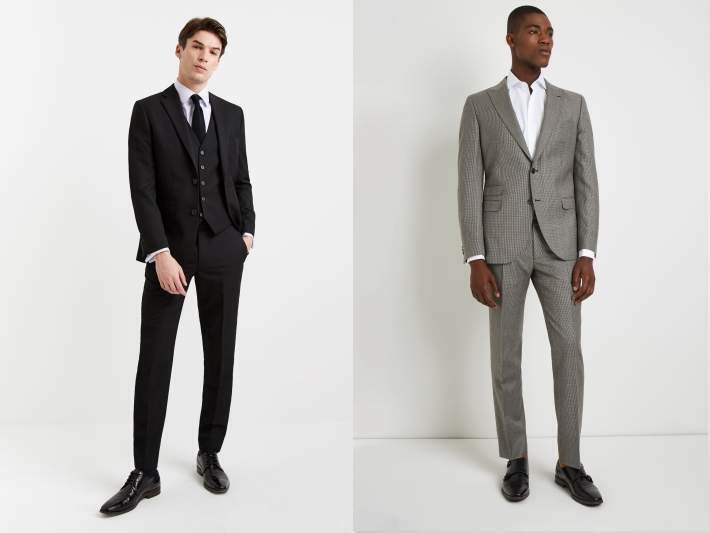 I do have one grey / white suit in Cotton , which I'd much rather wear in the hotter months of the year - it just feels like a cooler material for it and lighter to wear as well , for everything else I'd be in the Wool ones. I do find that Cotton creases a little bit easier than wool, but maybve just me. They are both great materials though! What I can say from my experience, wool is softer, finer and warmer than cotton. I would not choose to wear a cotton suit; but may have a cotton informal jacket. Usually the fineness determines the weight and consequently the cost of the material. The finer the wool the the more expensive it is, but also the type of wool i.e Mohair and Cashmere being some of finest and consequently most expensive. My father was a tailor and I have felt all the material that he had and 100% wool was always the preferred choice. He did make cotton suits where customers brought in their own fabric. Common off the shelf suits have a Cotton/Wool blend, which is what I had in the past, however on a recent holiday to Thailand I had a made to measure suit and it was so cheap I chose the finest, softest material available which was Mohair. Great offer, but site is painfully slow! You won’t look like the guys in the pictures. Had a few suits of them last week when there was 30% off. All are going back. One trouser was well smaller than it shoud be so the top was no good. One the top was too small and the 3rd just looked cheap and thin. Had a couple next ones which seem to fit my size properly. Got a slim fit suit from them and the shoulders were way too tight that the shoulder region just bunched up. Fit of the trousers were fine on the other hand. Peculiar slim fit I must say. Going back in any case. True. Only way to ever get a good fit is tailor made. Too tight, too short, no socks! What's wrong with 'yoof'? Looks like he grew out it 5 years ago. BUt then again some of their sizes seemed on the small size to me. Wool blend suit will last for years, looks as good as new after dry clean. Unidays works too at 15%! I bought two of these a few months back, they were ok for the price but the jacket was ruined on the first dry clean, the glue inside must have heated up and it looks all bobbled so I binned it. I have since replaced them with two new suits from TM Lewin for a similar price (using discount codes plus their sale) and they are significantly better quality than Moss. Extra 20% off with voucher code MVC20100 if you spend over £100. Its amazing how a suit can change a mans appearance, he looks like a …Its amazing how a suit can change a mans appearance, he looks like a different bloke once he puts the grey suit on ! Better off at suit direct in my opinion!